Robert W. Pretel, D.D.S., M.S.D., became interested in dentistry at an early age in his father's dental practice in Fairfield, California. This led to a very strong background, both academically and clinically. After receiving a Bachelor of Science degree from St. Mary's College, Dr. Pretel obtained his dental training at the University of the Pacific in San Francisco. He went on to pursue post-doctoral training and certification in periodontology and implantology at the Boston University School of Dental Medicine, where he also received his master's degree. His master's thesis on gene regulation produced several published articles and its research provided him with a strong understanding of the role genetics plays in periodontology. Dr. Pretel has received extensive training in the latest periodontal techniques. His excellent qualifications and quick humor put his patients at ease and allow him to provide the necessary comprehensive periodontal and implant treatment. 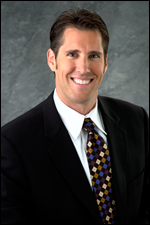 Dr. Pretel is a member of the American Academy of Periodontology, Academy of Osseointegration, California Society of Periodontics, American Dental Association, California Dental Association, and the Sacramento District Dental Society. When not practicing periodontics, Dr. Pretel enjoys spending time with his family and friends, water and snow skiing, snowmobiling, and playing music.